I am adding a few new things today...one of them is this sweet keychain. 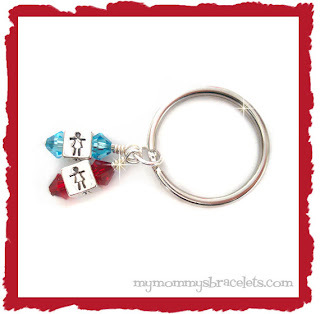 It is priced at only $7.95 which includes one dangle. It's not too small or too big...just perfect! Great for Daddy or Grandpa too! I am so sorry it's been a long time since I have blogged...things are finally getting back to normal, for now. I also wanted to let everyone know that I will be taking a much needed vacation to New Mexico for some snow/skiing with my family. This will be a huge surprise for my kids, they have NO clue we are going anywhere...hee hee I am thrilled and can't wait to see the look on their faces! I will be gone from January 16th - January 24th. I will be available via email during that time for any questions you may have. Orders may be placed at any time online, but will not be processed until I return on the 24th. Thank you in advance for your understanding...belive me, you WANT me to take a vacation. I am trying to get some new items on the website...so be on the lookout.